Bars of a playable Mummy. can be summoned from canopic jars. Unfortunately, there doesn't seem to be a 100% success rate. You'll need to search plenty of Egyptian Tombs to find the Canopic Jars, because they are found ONLY there. And note that only the Canopic Jars that count toward a set will work. The regular jars you find, or buy in shops, are just loot to sell. You can check that you're using the right ones by noting that the jars are stacked separately in inventory instead of with your other Egyptian relics. This kind of Mummy will be treated as an Elder by the game. 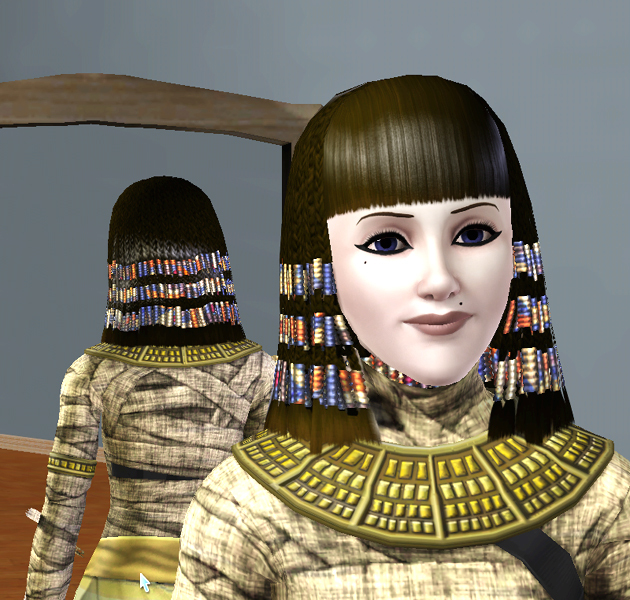 the creator Sim may be stuck in front of the sarcophagus waiting for the mummy to emerge. This will occur if the Sim in question has completed the Canopic Jars relic collection and has more than one of each type of jar in the set in their inventory. 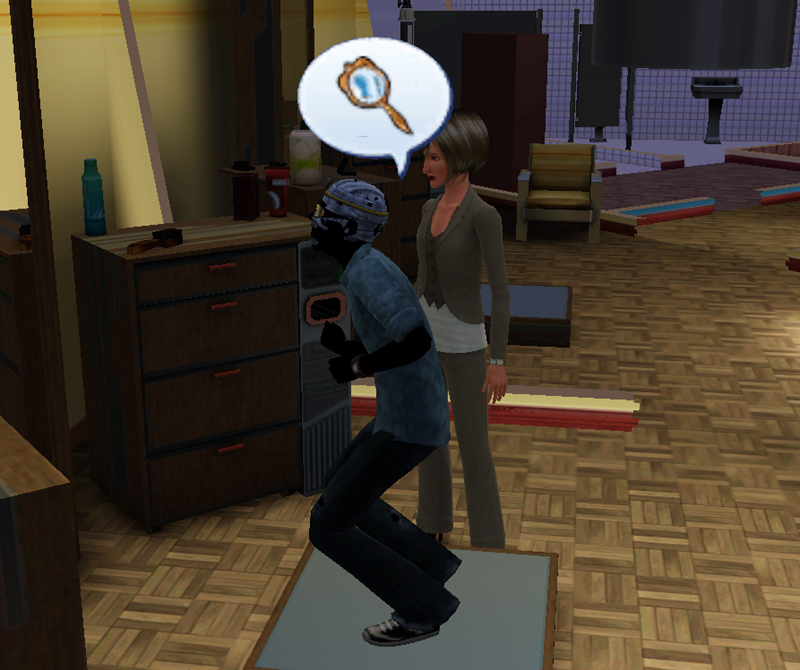 To avoid this glitch, ensure that your Sim is only carrying one jar of each type before summoning a mummy. a regular Sim can be turned into a playable Mummy by sleeping in the Cursed Sarcophagus of the Kings twice for a few hours - roughly, 24 Sim-hours in total. Sims who were transformed into mummies in this way will retain their original age. 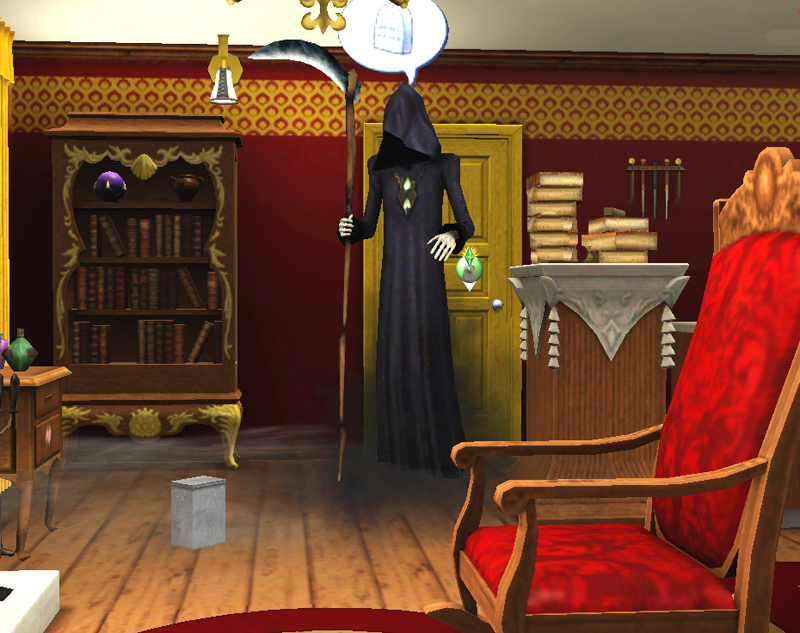 The first time they emerge, a message will appear to the player hinting at the cursed powers of the sarcophagus affecting the Sim. The next time that Sim sleeps in the sarcophagus, they will emerge as a full-blown mummy. Sleeping in the Cursed Sarcophagus has an advantage however; a Sim's Body skill increases while they sleep, though the progress bar will not show. Sims as young as Teenagers can sleep in the Cursed Sarcophagus. To obtain a Mummy from a Cursed Sarcophagus, acquire all 5 pieces of any sarcophagus, construct it and complete the Canopic Jars relic collection with the 5 types of Canopic Jars in your Sim's inventory. Click on the sarcophagus and choose the option "Summon Mummy". This will consume the jars but a mummy will emerge and be added to the household! Mummies enjoy longer lives than normal Sims and do not have the energy or bladder needs or normal Sims. But even if University Life is installed, mummies cannot go streaking. They NEVER take the bandages off. Alternatively, with Supernatural, Sims can mix or buy the Bottled Mummy's Curse to turn either themselves or another Sim into a mummy. To reverse the mummy state and become a normal Sim again, simply have a mummy sleep in the Blessed Sarcophagus of the Kings for a day or so, or get a snake from a snake charming basket to kiss the Sim by playing for a long time after you buy a cobra. When the Sim emerges, they will no longer be a mummy. Mummies are much stronger than normal Sims. They can even fend off the attack of the zombie bear when exploring the catacombs at the graveyard! They're also immune to electricity; whether they get shocked by an electric trap or while upgrading an item, they suffer no harm, which makes them excellent repairmen or Adventurers. If a Burglar sees a mummy, he will immediately run away. A Mummy may also become a "human" Sim by using a Potent Cure Potion. You will have to restyle the Sim - I took this guy to the Salon. The Mummy head-covering seems to be a hair. He does have a tendency to get back into his mummy wraps from time to time. Mummies have gender. However, they are unable to reproduce in the "normal" way of Sims. Mummies move incredibly slowly, and thus will limp from location to location. Usually, this can make them to lose the chance of doing what they were going to do (going to work, social interactions with other Sims, etc.) It may well be worth seeking out a mod to make them walk as normal Sims. Mummies are also covered in old, flammable rags. Thus the mummy Sim will receive the 'Scared' Moodlet whenever they are in the same room as a lit fireplace, and will "quickly" (as quickly as a Mummy can) move to put it out. Sadly, that's not really enough time to put it out before they catch fire! And they do really die. Catching fire can be avoided by either getting the Sim to take Fireproof Homestead (Ambitions) as a Lifetime Reward or getting soaked in showers and diving wells. Every time they get in contact with water they get soaked, so they will leave puddles around the house. 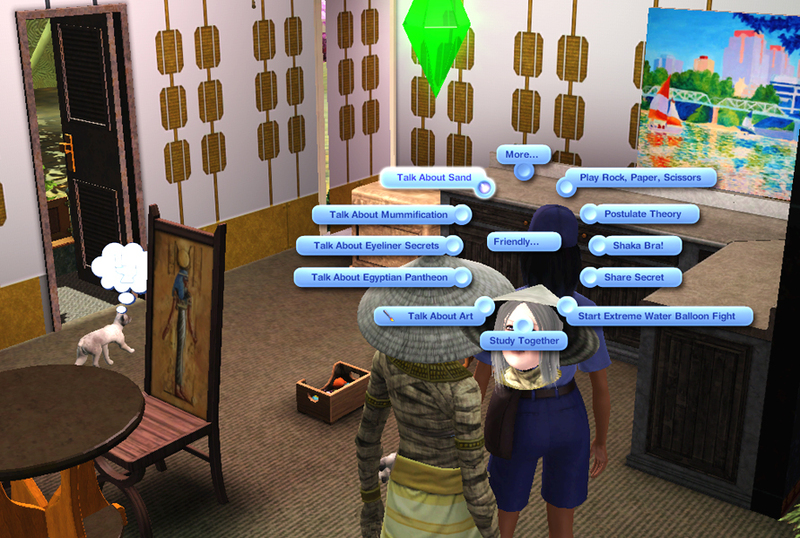 When non-mummy Sims (including SimBots) see a mummy, they will interrupt what they were doing (the whole action queue) and get scared/excited (depending on personality and traits). They won't be able to get back to do what they were doing by themselves. Ghost Sims can also become mummies. Other Sims will react to a ghost Sim who has been mummified as if that Sim was a mummy, rather than react to them being a ghost. Being both a ghost and a mummy, does not, however, make the Sim fireproof! When a mummy ghost catches on fire from a fireplace or fire pit, he or she will remain on fire. Since ghosts cannot die, they will stand in place pointlessly trying to put themselves out, until another Sim puts them out, they jump in a well or use a Shower in a Can, or the player uses cheats to put out the fire. A Sim that is a mummy won't be attacked by other mummies. Some vampires wish to fight mummies, even if they have never met a mummy or been to Egypt. An NPC mummy will normally be inside its sarcophagus resting. However, if a Sim looks inside the sarcophagus or steals a treasure in the mummy's chamber, it will awaken and pick a fight with the Sim that is treasure hunting. However, a fight can be avoided by simply leaving the room where the mummy's sarcophagus is, as the mummy is unable to leave the room. If the Sim happens to have a Mummy Snack in their inventory, the mummy will automatically remove it and return to their sarcophagus until they are disturbed again. A mummy can be defeated if a Sim has sufficient Athletics and Martial Arts skill, which can be trained in Shang Simla, China or in museums with martial art items, such as France. As (NPC) mummies are vulnerable to fire, they can be tricked onto hidden fire traps, incinerating them, but a playable mummy is immune to fire traps in tombs. Maybe the tombs' traps ere set by their relatives? So a playable Mummy should be good to use as an Adventurer. 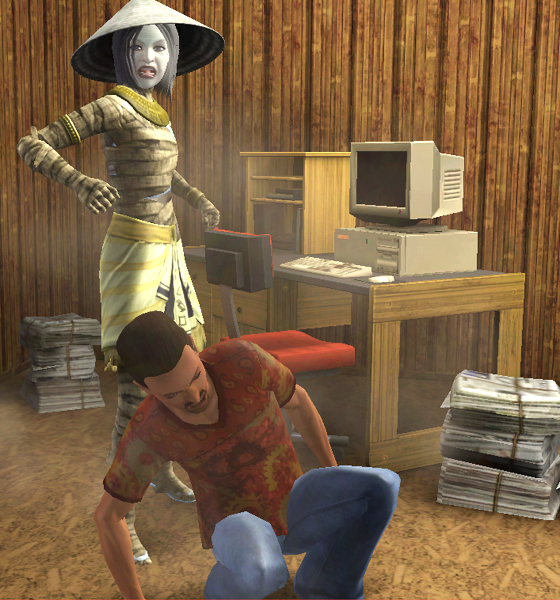 A Sim may be cursed when a mummy breathes a dark foggy haze on them during a fight. The Sim will not be cursed if the mummy merely knocks them unconscious. A message will appear warning the player of the curse. The Mummy's Curse affects a Sim for 14 days. The -25 moodlet continues throughout, and then your Sim will die. Can a playable Mummy cast this curse? Or do they have to buy the bottled version from the Elixir shop? The Sim must plead with the sphinx in Al Simhara, explore it completely, and use the "cleanse" interaction on a special statue. Rebuild both King's Sarcophagi - Blessed and Cursed, sleep in the Cursed Sarcophagus first (turning the Sim into a mummy) and then in the Blessed Sarcophagus. This can be done in the Sim's home. Kiss a King Cobra: buy a Snake Charming Basket from the general goods merchant in Al Simhara. Practice with the basket until the option to buy a cobra for $1,000 Simoleons comes up. Buy it, then keep practicing until your Sim is able to kiss the cobra. This will remove the curse and give your Sim a positive moodlet instead. Since the basket is portable, this is a great option. Make the Sim meditate. This makes the curse vanish in a few hours. With Ambitions, use a time machine and travel to the past. If you're lucky a message will say "<Sim> was deep in the past and accidentally got the inventor in trouble with the pharaoh of Egypt! He was fired and mummies were never invented. <Sim> is cured!" With Supernatural, have a Witch cast a Sunlight Charm. This will remove the curse due to the negative mood drop. With Pets, befriend a unicorn and have it bless your sim to remove the curse. This is my favored way of removing the curse. Shortly after being cursed, if you have no other opportunities in Egypt, you'll get an adventure called Cursed!. While you don't have to do the adventure to gain entry to the Sphinx, you can turn it into a nice way to earn some extra VISA points. Not only are you treated to an impressive visual display by the Great Sphinx, you'll also unlock a good place to come back and collect tons of gems later. Inside the Sphinx, the puzzles aren't too hard. You'll work your way down, through a lower level, then back up where you can ascend to the soulpeace chambers. Once there, you can have your Sim seek cleansing by clicking the statue. A little ritual will occur, where your Sim meditates and hovers in midair. 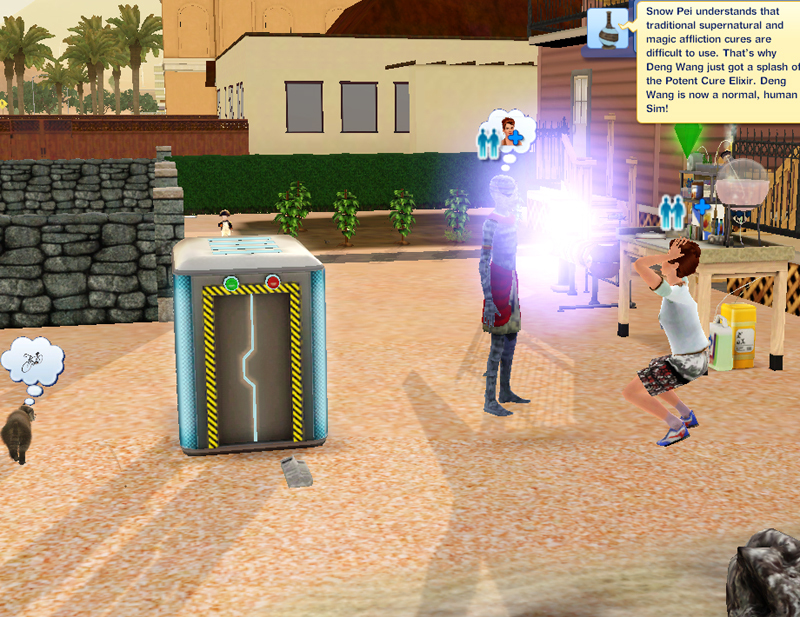 Then, in a burst of energy and a transference of power from the Soulpeace, your Sim's curse is lifted. Be sure to check behind the Soulpeace Statue for a hidden room where you'll frequently find Soulpeace Gems. Get the Moodlet Manager lifetime happiness reward and click the mummy's curse moodlet. Use testingcheatsenabled cheat, press and hold shift and click the mummy's curse moodlet or hold [shift] and click on the mailbox, then clicking on "make all happy". This will max all motives for the household and also get rid of the mummy's curse moodlet on any cursed Sims. Or, if the players prefer to leave the other Sims in the household as they are, they can control click on the moodlet affecting the Sim with the testingcheatsenabled true cheat on, and the moodlet will be eliminated. This can also eliminate other moodlets the Sim has. If the curse is not lifted within two weeks the Sim will die. Within the final days of these cursed weeks, a dark black haze will slowly surround the borders of the player's computer screen or game window whenever the affected Sim is selected, as if the vision of the hopeless victim is slowly clouding over. Three hours before the cursed Sim dies, a mummy face appears on the screen and fades in and out. As time passes the face becomes blurry. The ghost of a Sim who died of a mummy's curse will have a black, smoldering hue. In addition, one of his or her traits will be replaced with the Evil trait, noticeable when a ghost is revived through the Science Laboratory. They have some topics to discuss that may or may not be fascinating to other Sims. In Ambitions, Twinbrook has two Sims who died of the Mummy's Curse. Even without World Adventures installed, the player can see the ghosts, interact with them, and resurrect them. Moonlight Falls also features a Sim who died from the Mummy's Curse, but like the ones in Twinbrook she can be interacted with, made playable and brought back to life. Use a Young Again Potion. My playable Mummy, Umay, summoned from a Sarcophagus, was able to use a Young Again Potion and aged back to YA, still retaining her Mummy form and skin; with the true Mummy skin, there is a slight gap between the top of the wrappings and her head.